Mr. Governor of the Province of Buenos Aires, Mr. Mayor of Zarate; workers of Atucha II; workers of the Argentine Construction Union (UOCRA) who helped build this Power Plant; technicians; engineers; and scientists. All of us, Argentine workers, who are now celebrating together with our fellow countrymen and countrywomen this historical landmark: the full incorporation into the Argentine Energy System of the Third Argentine Nuclear Power Plant. And to those who some days ago were doubtful of the agreements we went to sign in order to make our economy grow and attract new investments, I want to say that all the work for this nuclear plant was done by Argentine people, Argentine brains, Argentine labour, because, you know something? 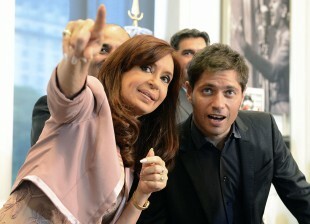 We, the Argentine people have begun once again to go down a path that we had abandoned. In the nineties, Argentina —partly, it is fair to say, because of external pressure—abandoned its role as the most important nuclear actor in Latin America. Today, we are reclaiming that role by fully opening this plant but, mainly, as a result of the decision made by President Nestor Kirchner in 2004, when he launched the Argentine Nuclear Program, which ensured the continuation of this plant, Atucha II. Here you can see Peron opening Atucha I. That is when Argentina began to develop its nuclear program. And now, on the following page of this book prepared by the nuclear authorities is Nestor Kirchner again launching a nuclear program for Argentina. These are the men who go down in history; the rest can be summed up in only 5 minutes on TV or a page in a newspaper. This man came here, to Atucha II, which was abandoned, its machines were barely maintained by the small staff that was left, it was in a complete state of neglect, he came and, just like he decided to finish the Yacyreta plant, he resolved to finish Atucha II. But that was not all, he also said: “let us invest in actions to put into operation once again the Argentine Atomic Energy Commission and the Pilcaniyeu uranium enrichment plant, let us incorporate new and young blood, scientists, into this nuclear program”. Why did he do this? Because Argentina was taking back the position it never should have left; i.e. being amongst the 11 countries that produce enriched uranium. But with a difference, of course: our country is a leader in the field of nuclear non-proliferation. We are men and women of peace, we do not drop nuclear bombs on anyone and we do not threaten to use nuclear missiles against anyone. Our nuclear science is aimed at works such as this one here, at generating the 745 megawatts that we incorporate today, at building 88 % of this work domestically. This is also a business landmark. In 2003, the number of companies having certification for nuclear works in our country, the Argentine Republic, was zero; there were none. After the Nuclear Program, after Atucha, after the CAREM reactor, after the creation of the government-owned company INVAP, we now have 129 Argentine companies certified as nuclear companies, 25 companies with certification for the building of nuclear works and 104 companies certified as providers of such works. Nuclear energy went from representing 7 % of the energy mix to accounting for 10 %, as a result of today’s opening. Furthermore —I do not want to make any mistakes— we are saving money, and this concerns the Minister of Economy especially. Putting this work into operation means that we save, on a yearly basis, 400 million dollars in the import of fuels. That is, with the barrel at 54 dollars; if it were to increase, then savings would be even higher. But I would also like to mention the landmark this represents in terms of employment. The Nuclear Program has required 5,220 new specialists in the nuclear field; 1780 scientists and experts; 1100 adult professionals; 390 young professionals; 620 young technicians for Atucha II; 1330 nuclear welders. In 2003, the nuclear industry only had 3,000 workers; now it has 8,220 workers. This represents a 174% increase in highly-qualified workforce. Moreover, I wish to refer to the issue of how we need to change the energy mix, because we want to do so and we went to China in order to seek investments to incorporate two new power stations, one having 700 megawatts and the other, 1000 megawatts; one with a heavy-water reactor and the other with a light-water reactor, the latter requiring technology that we do not have yet because this is a heavy-water plant. Thus, we have made an agreement with China and we will incorporate new technology. But no one should be concerned, because 70% of the first power station will be and 30% foreign, while the second one, which requires more technology, will be “half and half”, 50-50, because of the high degree of technology transfer we require. We, the Argentine people, my fellow countrymen and countrywomen, also need to change and diversify the gas-dependent energy mix, a mix that relies heavily on gas. This is another reason why we launched the nuclear program and we began nuclear development. Not only because of power —I will now explain all the work we have done in the field of nuclear medicine and I will talk about what we produce— but also because we cannot be content with only one energy mix source. Look at what is happening with our Brazilian brothers who have a fundamentally hydroelectric mix and, thus, climate change and the resulting droughts affect it. As a consequence, they now have serious power and water supply problems. This is not due to inefficiency, but merely because of climate change, droughts and the fact that they have a mix which essentially pivots on hydroelectric power. This is why, in Argentina, hydroelectric and nuclear power must fully complement each other and, if I were given the choice, I would say that we must place even greater emphasis on cheaper, cleaner nuclear power that generates technology. Because, furthermore, my dear countrymen and countrywomen, we are not only producing power, but we are also intensively applying this technology to the field of medicine through nuclear science. Nowadays, Argentine produces 5% of the total molybdenum-99 at a global level. “And what is it good for?”, you might ask “that odd-sounding word”. The answer is: for all things related to radiopharmacology. And we are also producing —please help me, Debora, otherwise I will forget something. I cannot remember everything, even if I wanted to— cobalt. We are the fifth or third largest producer in the world. I did not have to look it up, I remembered it all by myself. My memory served me right. We are the third largest producer of cobalt-60, which is another important product, an important input for the healthcare field. And of course the nuclear diagnostic centres that we have opened and which have been incorporated by leading private healthcare centres, such as Fleni, the German Hospital, the Italian Hospital. In this respect, we are building many nuclear diagnostic centres, a lot of them. We are working and we will continue to grow. Since 2003 we have not only added science and highly qualified work to this energy mix, but we have also built sovereignty. When Nestor Kirchner came from the South of our country in 2003, only 5% of Argentina’s total power system was State-owned, while 2% was owned by the provinces, 13% by nationals of the private sector, and 80% was in the hands of foreign private parties. That was the situation in 2003. Today, the Argentine State… and by this I mean you, because often it seems that when we are talking of the State we are talking about somebody else, but in fact we are talking about the 40 million Argentines. The State is not mine to take home, I do not own it. The State is here to stay, and in 2015 we must guarantee that whoever is at the head of this Argentine State has the same ideas with regard to autonomy, sovereignty, social income, labour for the Argentine people, science, and technology. That is the best legacy we can leave. Today, the Argentine State —that is you, the Argentine people, my fellow citizens— owns 45% of the national power system. The provinces still hold 2%, and local private companies —some of which have been complaining, though not all of them—, which used to own 13% now own 30% of the national power system. No insults please, we are not insulting anybody because everybody has the right to think what they please. As for foreign private companies, they went from 80% to 23%. We have not only made developments in science and technology, but we have also increased the national autonomy in relation to a strategic resource as is power. We can also make some comparisons looking back to 2003. Economic activity and energy consumption, irrespective of the index used to measure it, is twice as high as it was 12 years ago. Today, Argentine households —your home and the homes of everyone who is here, and of those who are not as well— have the highest per capita energy consumption rate in the whole region. An Argentine household consumes 4 times more power than a Brazilian household, and 3 times more than a Chilean and a Uruguayan household. Do you know why that is? Because all of you have many things to plug in at home, things that you have been able to buy and you did not have before, because you used to have a fan and now you have air conditioning; because you have a new washing machine that maybe you did not have before; because you have a freezer compartment, you have a fridge, you have appliances. There is someone over there telling me that he has three air conditioning units… please set them to 24 degrees, my friend, because we have to make a reasonable use of energy. As we have a strategic approach, and since we know that history does not begin nor end when one comes or goes, in addition to this 11 million dollar program that we have pursued with all the investments —of which Atucha is only a part, though not the most important one—, we are launching the Plan 2015-2035, which is a 31 million dollars plan that is already underway. This plan includes the Carem nuclear reactor, a low production capacity reactor that can reach between 200 and 300 megawatts for those regions and areas that do not need a large supply but need energy all the same, like small towns and small regions throughout the country. During these years we have strengthened state-owned company INVAP in a why that can almost be described unprecedented, to the extent of placing a turnkey nuclear reactor for the very first time in Australia, thus competing with France —a leading power in nuclear matters. We are talking of a turnkey project, whose design and work was done by Argentines and brought into operation by Argentines. And now, thanks to the agreements we have entered into with the People’s Republic of China, we will be able to put into operation two more high-technology nuclear plants in order to continue creating jobs. So, please, I would like to ask some people who tried to create confusion among the Argentine people by saying that this President, who had the honour of promoting the largest industrialization and job creation project ever since Peron’s administration in 1945, is not defending labour and local companies, to think again. However, those voices are not ingenuous or, as someone has suggested, merely expressing political differences. I am not ingenuous, nor is any Argentine. I would like to tell all of the Argentine people, irrespective of their way of thinking, of where they stand, of who they will vote for, that we are not isolated. We live in a world that is crossed by huge geopolitical and strategic interests, which obstructed and closed down the nuclear program in Argentina in the 90s because they were not interested in it. This explains why our young university graduates chose to settle abroad, because they did not have the opportunity to further the knowledge that they had gained at the public and free national university, and so they left the country. I ask you to please open your eyes. I am not talking about plots; this is not a world of plots. Let’s leave that for John Le Carré novels. This is a world of interests that want some people to be controlled and some others to be in control. But then they meet governments such as this one, which will not let anybody tell it what it has to do. That is the problem. 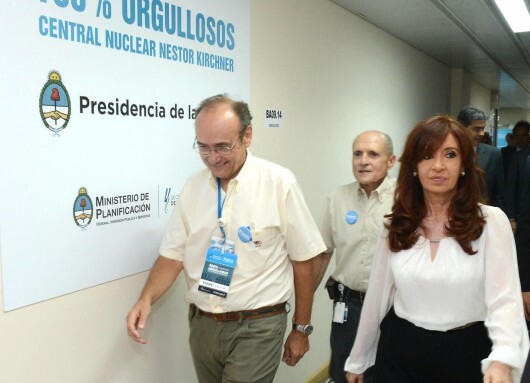 Argentina is back in the select club of 11 countries that can produce enriched uranium, but with one difference: we have our own technology, which makes it possible to enrich uranium with lower concentration levels. This is what is bothering some people and the reason why yesterday the Foreign Minister sent two letters to two important international players, at a time when issues that some people want to bring to Argentina are being debated worldwide. In Argentina we do not want problems that are not ours to deal with. Our idiosyncrasy, our customs, our ideals are those of a peaceful country where different religions, ethnic groups, and immigrants coexist. We are all the offspring of immigrants. This is a country where we help each other, where we may argue a bit more about football or politics, but never about what God we pray to, what religion we profess, or what ethnic group we belong to. The important thing, my fellow Argentines, is to be aware of the fact that today there are many forces in the world. They are out in the open for everyone to see and they intend to create trouble where there is none. This is why yesterday the Foreign Minister sent those letters. Some people have tried to ignore things and look the other way, but I pray for all my fellow citizens to read attentively each of the paragraphs of the letters we sent, because they embody the message that I am trying to convey to all my fellow citizens, and also to the men and women who will govern our country after 10 December 2015. We, Argentines, have worked hard to get here. We have worked hard for Atucha II. We have worked hard for the repatriation of more than one thousand scientists, in order to promote substantial scientific, educational and income growth in our country. We cannot let anyone pass their conflicts onto us, or turn us Argentines against each other. This is why the Foreign Minister sent those two letters yesterday– it is no coincidence. There are some who would rather see Argentina without a nuclear program. There are some who would rather Argentina did not pursue scientific development and had low salaries instead, and cheap labour. 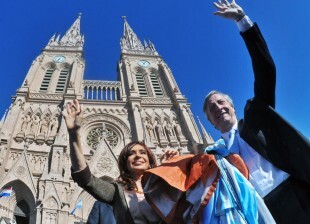 There are some who would like to see an Argentina like the one Nestor Kirchner had to lift up, as from on 25 May 2003 when he took office with a mere 22% of the vote. But we are going even further. Not only do we want to be active participants at the international level, having recovered the honour and dignity of a country that is now an example in terms of debt reduction, economic growth, social inclusion and nuclear development, but we are also –and I am really proud to say this– leaders in the field of human rights. We have created a model worthy of international praise. After going through the tragedy our country went through, we Argentines have resorted to our constitutionally appointed judges, our Constitution, and the guarantees of due process and self-defence granted to all Argentine citizens, in order to create a system that is currently an example. This is an achievement that some abroad –but, most importantly, many at home– deeply resent: the repeal of the shameful due obedience and full stop laws. For those who like talking about integration at the world level, I would like to recall the time I travelled with Nestor Kirchner during his first European tour in 2003, a few months after he took office as President. At the time, Jacques Chirac was the president of the French Republic. If we were to establish his political affiliation, we could say that he is more of a conservative or a right-wing politician. Still, when he met with Nestor Kirchner, then Argentine president, at the Élysée Palace, together with the Argentine delegation that I was part of, the first thing he said was that French society –the one many of our critics admire– could not understand, let alone accept, that those who had murdered, tortured and abducted French citizens were unpunished and freely walking the streets. 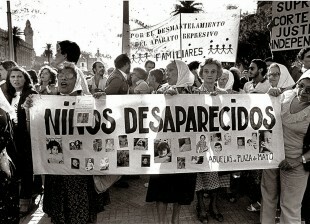 At that time, I felt embarrassed because we were unable to explain to the president of a foreign country that the Argentine Congress had passed laws that had pardoned torturers and kidnappers after the trials of the military juntas were over. It was not only a dozen or more men who were responsible for this. A few of them gave the orders, but when these orders were executed by the lower ranks, they cost the lives of millions of Argentines. They may try to call it something else, but it is our fight against this impunity that they still resent. And you know what? I am really proud. I am proud that I can now visit any country in the world, even those that have clandestine detention centres and detainees who have not been given a fair trial, or those that drop bombs on civil populations and kill children, women and seniors… I can visit any of those countries, stand face to face with them, and tell them that Argentina is governed by the rule of law. No Argentine citizen can be put into jail without a warrant issued by a competent judge or a final judgment, since constitutional guarantees are firmly in force in my country. This is also something all Argentines have achieved. A Nation is not only about economic growth like the one we have experienced and promoted. A Nation is not only about the wonderful Atucha II nuclear power plant, or all the scientific and technological development we have achieved. A Nation is not only about millions of jobs created and the best minimum wage in Latin America, collective bargaining agreements, pensions, or our Universal Child Allowance Program– a Nation is not only about this. Nine new public universities, thousands of kilometres of routes and highways, thousands of kilometres of oil pipes and high-tension lines bringing energy to Argentine households… A Nation is not only about all of this. A Nation is ultimately about people who live in peace with each other, about judging and punishing those who have committed heinous crimes. Otherwise, we would be living in a pre-democratic State– and I want to live in a democracy. This is why, in order to continue down the path of progress, Argentina has to enter new markets and partnerships… We have to do it because there’s a new and different world out there. When I was the age of some of you and went to college, the world was divided in two: there was the communist East on one side, and the Christian West on the other, where our country was. This was the world. I am not talking about long-gone centuries, I am talking about the 1960’s or 70’s. Today, the world has changed to such an extent that economic and incredible technological powers have emerged which were unthinkable during those years. As a post-war Italian Minister once said, when one is not important enough to change the times, one has the obligation to change with the times. This is what we, Argentine leaders, have to do, whatever our political affiliation and the tools we choose. In order to lead our country down the right path, we need to be aware that there is a new world out there, and new players. This is far from being something bad… Indeed, this is something positive. It allows us to have new partners and stop playing secondary parts. In the past, we were constantly offered secondary roles— but Argentina is tired of secondary roles. We want to play a leading role for a change. This is why we are establishing strategic partnerships and we are open to listening to everyone. If other countries and powers want to offer the same financing terms and the same possibilities, we are willing to listen to anyone– but with no imposition of conditions… because the leader of this country is woman enough to stand negotiations–at least until 10 December, when the people may choose to change this. I believe that it is not your ID that determines how much of a man or a woman you are. I believe it is the attitude you have every day, the decisions you take at the government level, that help chart the course for a country – to couch it in terms more appropriate to this panel. Yesterday I was reading and I thought of Mr. Juan Carlos Lascurain. I can’t see him… Mr. Lascurain, please, stand up, I would like to greet you… Thanks. You may wonder why I want to greet Mr. Juan Carlos Lascurain, the vice-president of ADMIRA, the largest employers’ association of the metal industry. I do not know if yesterday you had the chance to read a renowned morning paper of the city of Buenos Aires, which included an extensive interview with a former president and currently active member of the Argentine Industrial Union (UIA). I know you need to work and that your jobs are not something you have to thank me for. 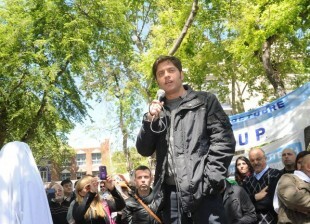 It is my duty to create jobs for all Argentines, so please do not thank me for that. For those of you who did not read the interview, irrespective of the heading on the front page, it is worth mentioning that it describes the way in which decisions are taken at one of the most important business chambers in the Argentine Republic. It is good that this mechanism is explained, because it is time to get rid of all the secrets and confidentiality around political plans. Meetings and their content should be made public, for the people to know what their businesspeople, union leaders and political leaders talk about. Yesterday Juan Carlos recalled a story related to the recent debate about the convenience –or not – of the agreements entered into with China, the terms of which are exactly the same as those of the international agreements entered into in 1986 and 1987, when a different party was in power. I was impressed by one of the many stories Juan Carlos recalled. I recommend that you read it, because it accurately depicts the struggle for power in Argentina. A struggle that many refuse to talk about and try to keep secret… A struggle that is covered up and concealed by the media. Juan Carlos talked about a meeting between the highest levels of UIA and the De la Rua administration. 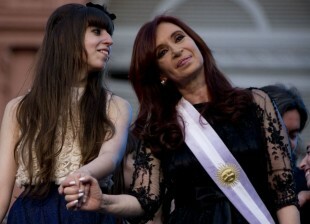 No booing please, I would like you to pay close attention to this, which is an interesting lesson for all Argentines. Juan Carlos recalled that one time when they had been invited by the Argentine President, then Mr. De la Rua, to have lunch at the Government House. During that lunch, one of the businessmen, who is currently one of the heaviest critics of the agreements we have entered with China, repeatedly banged his fist on the lunch table, making dishes shake, until the President had to ask him to calm down… I don’t remember exactly why. The thing is that Juan Carlos then wondered: Could any Argentine think of someone banging their fist on the table and shouting at the current Argentine President? This is the real question in Argentina today: Nobody shouted at Nestor, who gave his life for this country – and certainly nobody shouts at this President. Not even Nestor shouted at me, let alone a businessman. 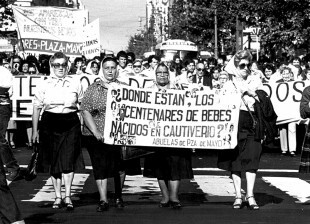 This was the real problem of Argentina: in the past, it was governed by people who had not been elected by the people, which is why anyone could come and bang their fist on the table, making dishes fly through the air. This depicts the struggle for power I was talking about; but power has to do with the people. Indeed, the struggle for power does not have to do with deciding if the President is more powerful than corporations or vice versa; it has to do with the people. If the ones who have more are more powerful, the people suffer, and this is not a problem between the President and corporations… it is a problem for the people, rather than a problem for political leaders. The key about politics is knowing what we want to become Presidents for, who we are into politics for. All my life, since I was very young, I have been a political activist. This was because, ever since then, I wanted to make a change, I even wanted to change the world. When I received the enormous responsibility and tremendous honour of being elected twice as the President of the Argentine Republic, I set my mind on continuing with the policy of changes Nestor had envisioned for Argentina. This is what I am doing now and what I will be doing until my last day in office: I will keep on working to keep on making a change. As long as there remain poor people in this country, as long as a child needs to receive the universal child allowance instead of the family benefit of his parents’ job at a factory, school or university, I will have a duty to the Argentine people. And as long as we have a duty to the Argentine people, politics has to remain committed to the interests of the people and the destiny of the Nation– there is no other way. Thank you, Argentina. Thank you all.